As NBA environments go, they don’t get much more different than Phoenix and New York. It didn’t take first-year Knicks coach Jeff Hornacek long to learn that much. “It’s a little different,” he says with a laugh, even saying it twice for effect. For six of his 15 seasons as a player, and nearly three years as head coach, he worked for the Phoenix Suns in that desert landscape where the days are so much hotter than the spotlight. Their basketball team was mostly beloved, especially when he turned things around during his debut campaign as coach three seasons ago. The headlines would burn every so often, but nothing like the constant hot takes that come with coaching in the world’s biggest media market. With Hornacek set to return to Phoenix Tuesday for the first time since he was fired in February, and with his Knicks an early surprise at 14-10 (third in the Eastern Conference), he discussed his situation with USA TODAY Sports recently. From the early observations of franchise centerpiece Carmelo Anthony to the improved supporting cast to life living on the Upper West Side to his view on LeBron James’ recent exploits at Madison Square Garden, Hornacek covered a lot of territory before heading back to his old stomping grounds. 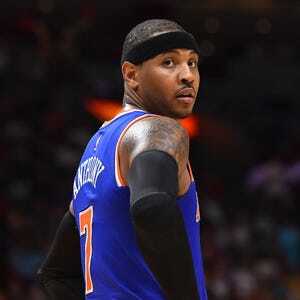 Q: What are you seeing out of ‘Melo this year as far as his game changing within this different context? Q: Even at this late stage of his career, coming off the Olympics, did you see any minor tweaks in the way he approaches the game or the way his mind works coming off the gold medal (experience)? Q: I always wonder, does it put you in a tough, awkward spot when this stuff with Phil and Melo flares up every so often, where you become the man in the middle and guys are asking you about it? Q: What about this thing with LeBron throwing the water bottle. Did it bother you, and not necessarily as the Knicks coach but as a former player? Q: In general terms, how do you see the contrast between your Phoenix experience and New York, with all the periphery stuff that comes with this job? Q: Do you get a razzing even around town? How do the locals treat you on the street? A: “No, it’s great on the street. It’s amazing how many people will say stuff, and it’s been all positive, so that’s been fun. You walk the streets of New York, and you try to be incognito a little bit.